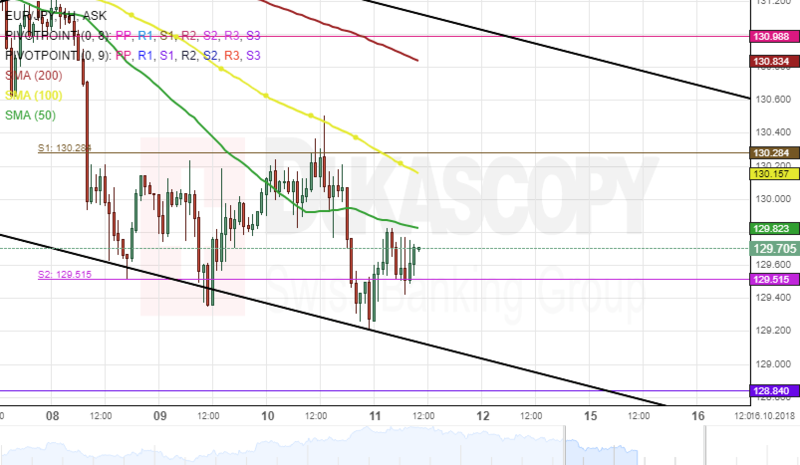 Downside momentum dominated the common European currency against the Japanese Yen on Wednesday. The exchange rate declined about 120 base points during the end of yesterday's session. By the middle of Thursday's session, the currency pair was trading below the 50-hour simple moving average at 129.67. Furthermore, the weekly S2 at 129.51 was providing support for the pair during the morning hours of today's session. If this support level as mentioned earlier holds, the currency exchange rate could make a brief movement towards a resistance cluster formed by the 100-hour SMA and the weekly S1 near the 130.28 regions during the following trading hours.